The view from my office window, originally uploaded by ccgd. Sunset on the 31st October from my desk - for the Flickr Scottish "Day in the life of" Group. Looking west over Inverness to the Loch Ness Hills. after the race, originally uploaded by ccgd. 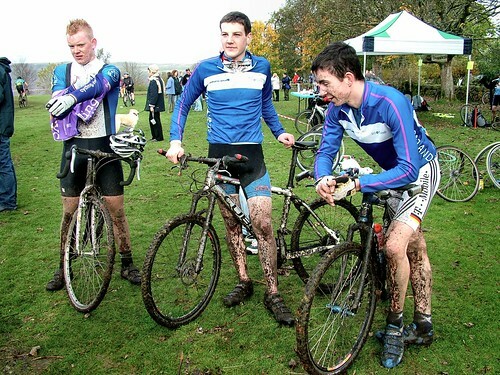 Mugdock country park Cyclocross race 2006 - very muddy as usual. Magnus had a comfortable win in the Youth section, with Mark Sinclair (right) having a great second place. 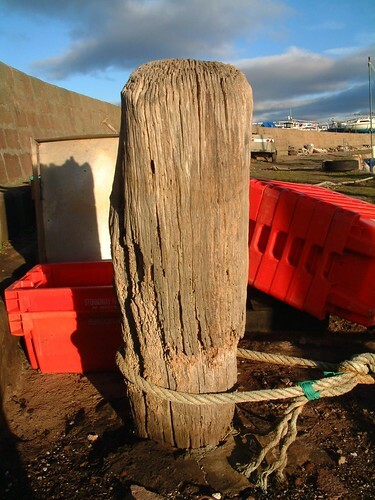 Mooring Bollard and Plastic Box's, originally uploaded by ccgd. Power cuts, originally uploaded by ccgd. 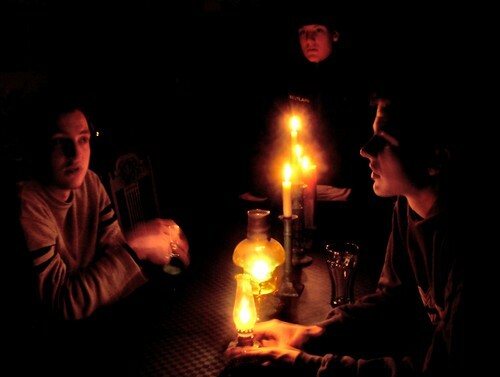 The boys lit by candles and lamps around our kitchen table. Power cuts and hellish weather in late October. It was the first time that all three boys have been home for a couple of months, as Charlie and Hamish are now away at Uni, and Magnus is often away, cycling, training or visiting his girlfriend in Paisley. 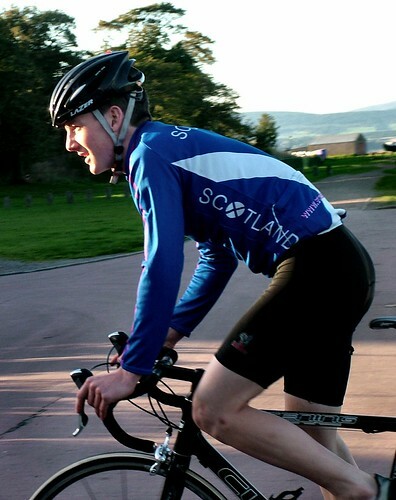 Luckily cycling, training and visiting his girlfriend are often the same thing, as she is another young Scotland star, on the track, rather than Magnus's MTB. Charlie is now a relaxed and serious third year, thinking about his thesis and looking for "interesting" Masters courses. Hamish is having a ball as a fresher at Strathclyde Business School, enjoying his course and having his girlfriend living in the next block of flats. One final point, this picture reminds me of the Procol Harem album cover "Every picture tells a story" - if you are under 45 ask your Mum, she might just remember it. Scotlands own little Mt Fuji, originally uploaded by ccgd. 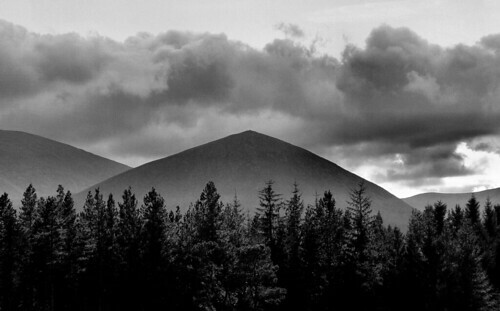 Clouds cast bands of darkness and light over Carn Eilrig in the Cairngorms. Ben Loyal, originally uploaded by ccgd. Ben Loyal seen from the Watchill - Coldbackie. Taken in October 2003 (I think, this version has lost its EXE data). This photo popped up in the most unexpected place today. Almost surreal. I was interviewing for senior staff for a new Research Lab that we are setting up, and the candidates all had to give presentations. "Excuse Me - where did you get the photo of Ben Loyal?" "Oh - I downloaded it from the web - Flickr I think"
"Mmmm - I took it you know......"
"So what's your view's on Copyright and License agreements?" 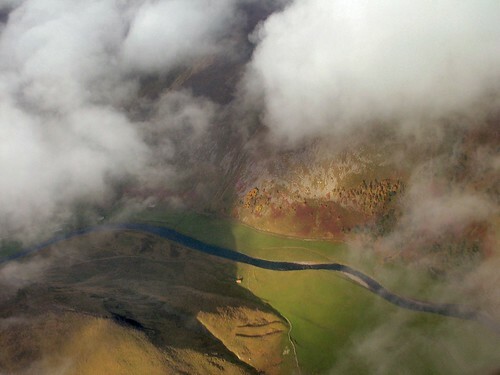 Strathnairn through the clouds, originally uploaded by ccgd. Approaching Inverness on a flight from Gatwick. The green of the glen floor through the clouds is just great. Charles river dawn, originally uploaded by ccgd. A golden morning on the Charles River in Boston. 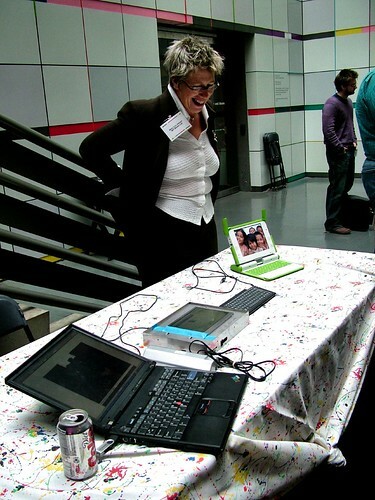 OLPC, originally uploaded by ccgd. Well I’ve been in Boston most of the week, for the MIT Media Lab Sponsor “Open House”. One of the roles of my team at Highlands and Islands Enterprise is to manage Knowledge Transfer activities for the region, and that’s why we actively work with MIT – one of the worlds best technology universities – to identify technologies, process and people who will benefit the Highlands and Islands. As always the range and breadth of activities at the Lab are mind blowing. Sat beside Deb Roy at Dinner Tuesday night, and caught up with his Human Speechome project. He has wired up his house – every room – with video and sound and is capturing three years worth of data (200GB a day!) “in an effort to unravel the seemingly miraculous process by which children acquire language.” It started when his son was a baby, and will continue until the lad is starting to talk. Wednesday was a full day of project outlines and demo’s. We have three Highlands and Islands Enterprise Research Fellows here at the lab, and caught up with them all, and reviewed where they were with their activities. One of the most fun is Dan Stiehl’s Huggable – a robotic interactive teddy bear – designed provide therapeutic support for elderly, hospitalised kids, and other people in need. We are talking about trials with Highlands and Islands schools, hospitals and care homes next year. Yesterday included an update on the One Laptop per Child initiative from Nicolas Negroponte, and May Lou Jepson demonstrated the revolutionary new display that has been developed for the project. 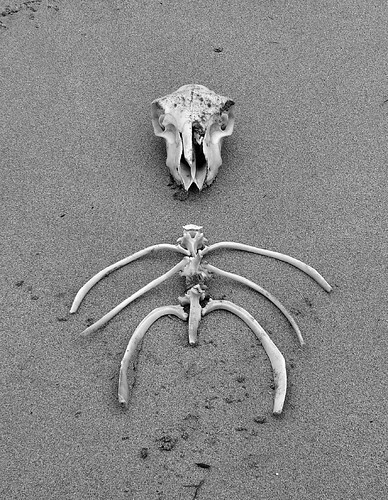 bones - or transient art, originally uploaded by ccgd. A very high tide, and a strong north wind had scattered sheep bones all over Coldbackie beach. Magnus collected a few and made this little display. 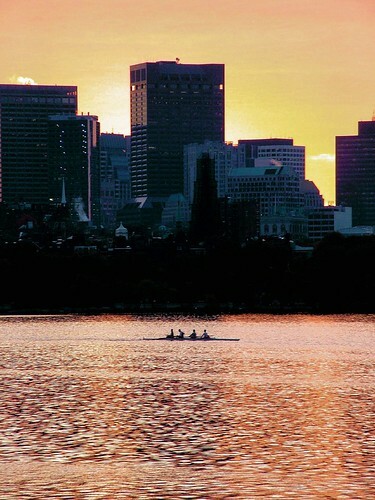 Charles river sunrise, originally uploaded by ccgd. 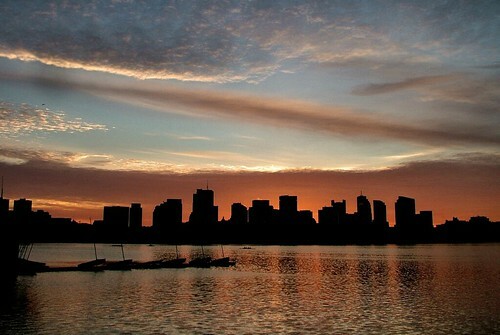 Here Downtown Boston looks like a little Manhatten, with a dramatic sunrise. 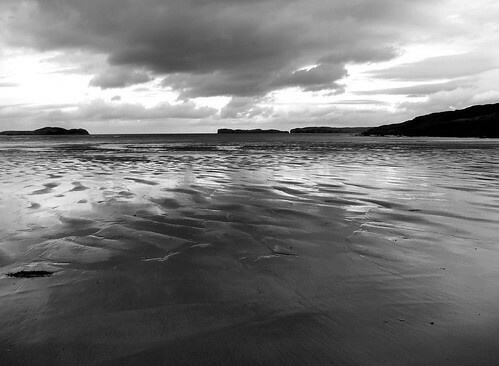 Coldbackie beach b&w, originally uploaded by ccgd. 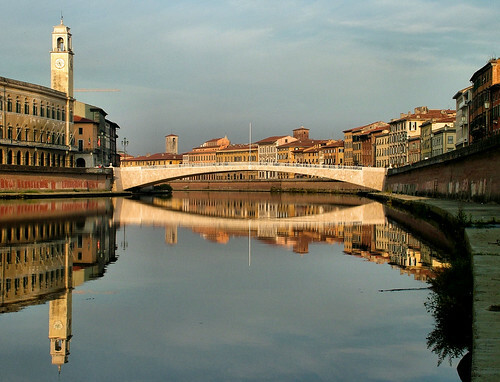 Pisa bridge, originally uploaded by ccgd. 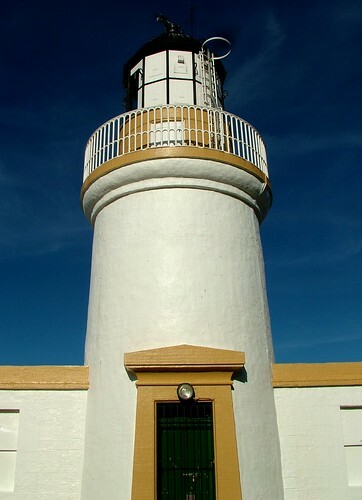 Lighthouse Blue, originally uploaded by ccgd. The colours as they came out the camera. Highland skies in September, wonderful eh? Scotland talent team, originally uploaded by ccgd. 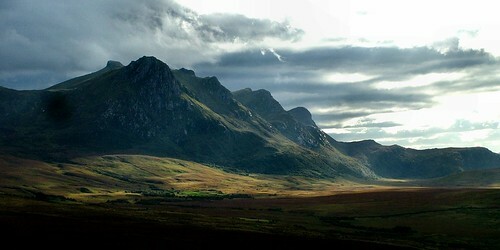 Ben Loyal from Braetounge, originally uploaded by ccgd. 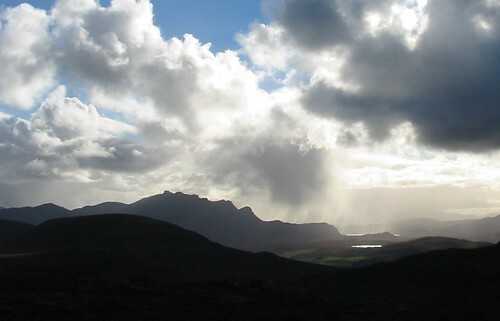 Driving home from Coldbackie this afternoon - snapped from Braetounge. Smokey Nimrod, originally uploaded by ccgd. 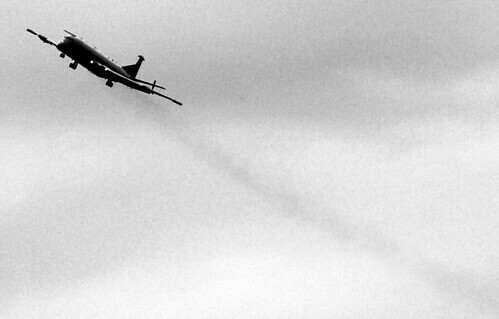 An RAF Nimrod in the circuit at Kinloss. 1950's airframe and engines. Noisy and smokey. Shot in colour, whilst getting in to may car after a meeting at our Forres office. I think it looks better in B&W. 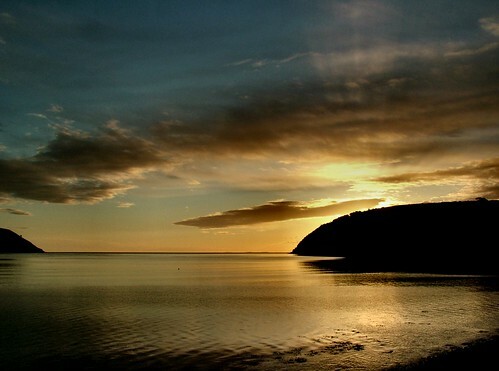 Aproaching Cromarty Harbour, originally uploaded by ccgd. This is the second Beatrice Windturbine, all tucked up for the winter. According to the press reports in the P&J, they missed the weather window for installing the second machine. The real story is, allegedly , that they were all ready to load the turbine on to the barge when someone drove a crane into the assembly. Bits broke and needed fixed, the Rambiz had to move on to another job, and so they missed the weather window. My source - a group of 12 year old Cromarty kids. They always seem to know better than a group of journalists. 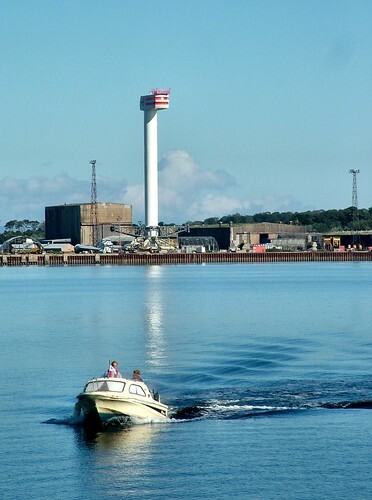 Looks like this tower is a feature of the Cromarty skyline for the next few months. Faint rays, originally uploaded by ccgd. Last few days of September, and the last few days of summer. Sunrise over the South Sutor.